Studies have traditionally focused on how aviation can impact climate change, but researchers from Columbia University have recently projected that airlines stand to lose millions of dollars as a result of global warming. Here’s why. Hot weather has forced dozens of commercial flights to be cancelled at airports in the Southwest this summer. This flight-disrupting heat is a warning sign. Climate change is projected to have far-reaching repercussions – including sea level rise inundating cities and shifting weather patterns causing long-term declines in agricultural yields. And there is evidence that it is beginning to affect the takeoff performance of commercial aircraft, with potential effects on airline costs. National and global transportation systems and the economic activity they support have been optimised for the climate in which it all developed: Machines are designed to operate in common temperature ranges, logistical plans depend on historical weather patterns and coastal land development is based on known flood zones. In the aviation sector, airports and aircraft are designed for the weather conditions experienced historically. Because the climate is changing, even fundamental infrastructure elements like airports and key economic sectors like air transportation may need to be redesigned and reengineered. As scientists focused on the impacts of climate change and extreme weather on human society and natural ecosystems around the world, our research has quantified how extreme heat associated with our warming climate may affect flights around the world. We’ve found that major airports from New York to Dubai to Bangkok will see more frequent takeoff weight restrictions in the coming decades due to increasingly common hot temperatures. There is robust evidence that extreme events such as heat waves and coastal flooding are happening with greater frequency and intensity than just a few decades ago. And if we fail to reduce greenhouse gas emissions significantly in the next few decades, the frequency and intensity of these extremes is projected to increase dramatically. The effects on aviation may be widespread. Many airports are built near sea level, putting them at risk of more frequent flooding as oceans rise. The frequency and intensity of air turbulence may increase in some regions due to strengthening high-altitude winds. Stronger winds would force airlines and pilots to modify flight lengths and routings, potentially increasing fuel consumption. The July heat-related Phoenix flight cancellations happened at least in part because airlines’ operational manuals didn’t include information for temperatures above 118 degrees Fahrenheit – because that kind of heat is historically uncommon. It’s another example of how procedures may need to be updated to adapt to a warmer climate. 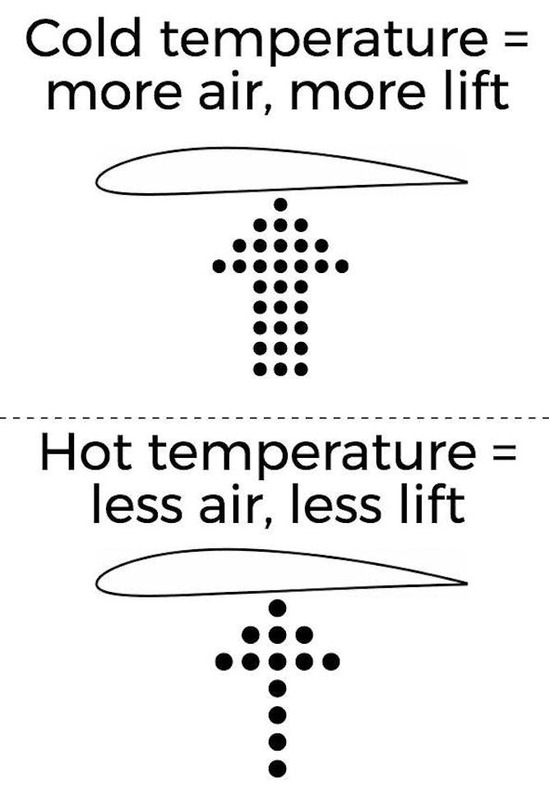 High air temperatures affect the physics of how aircraft fly, meaning aircraft takeoff performance can be impaired on hot days. The amount of lift that an airplane wing generates is affected by the density of the air. Air density in turn depends mostly on air temperature and elevation; higher temperatures and higher elevations both reduce density. 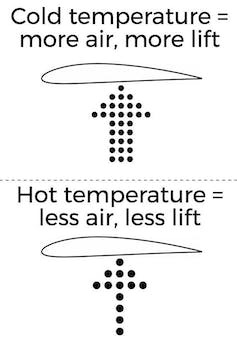 The lower the air density, the faster an airplane must travel to produce enough lift to take off. It takes more runway to reach a higher speed, and depending on how long the airport’s runway is, some airplanes might risk running out of room before reaching sufficient speed. When this occurs, the only immediate option is to reduce the aircraft’s weight to lower its required takeoff speed – by removing passengers, luggage and cargo. This is referred to as a weight restriction. Weight restrictions happen now, especially in hot places like Phoenix and Dubai and at airports with short runways like New York’s LaGuardia and Washington, D.C.‘s Reagan National, but our research suggests that they may become much more common in the future. Global temperatures have been steadily rising for decades, and they will almost certainly continue to do so. In some regions, there is evidence that the hottest temperatures may increase at a faster rate than the average, further stacking the deck in favour of extreme heat. These hotter temperatures will reduce air density and make it much more likely weight restrictions are needed for flights taking off during the hottest parts of the day. The frequency and magnitude of weight restrictions is projected to increase – in some locations, the number of days requiring at least some amount of weight restriction for certain aircraft could double or triple, perhaps covering 50 or more days per year. On most affected flights, the amount of cargo, passengers and fuel that must be removed to allow for takeoff will usually be small – between 0.5 per cent and 4 per cent of the total load. That means fewer paying customers on airplanes, and less cargo on board. When those restrictions add up across the global air transport system, the costs can be significant. Carrying just a fraction of a percent fewer passengers or less cargo can add up to millions of dollars in lost revenue for an airline over years of operation. That makes even small weight restrictions a concern in such a highly competitive and optimised industry. These limits could disproportionately affect long-haul flights, which require large fuel loads and often take off near their maximum weights. There are ways that airlines could mitigate increasing weight restrictions. The most feasible is to reschedule some flights to cooler hours of the day – although with air traffic increasing and many airports already operating near capacity, this could prove difficult. Many sectors of the economy, including the aviation industry, have yet to seriously consider the effects of climate change. The sooner, the better: Both airport construction and aircraft design take decades, and have lasting effects. Another potential solution is to build longer runways. But that’s not always possible: Some airports, like New York’s LaGuardia, are on coastlines or in dense urban environments. Even where a longer runway is technically possible, buying the land and expanding an airport’s physical area may be expensive and politically difficult. Aircraft could be optimised for takeoff performance, but redesigning aircraft is extremely expensive and can take decades. Manufacturers are always working to build planes that are lighter and more fuel-efficient. In the future, those efficiency improvements will be necessary just to maintain today’s performance. These changes are merely examples of the countless procedures, processes and equipment requirements that will have to be adjusted for a changing climate. Even if those adaptations are successful, they will take effort and money to achieve. Many sectors of the economy, including the aviation industry, have yet to seriously consider the effects of climate change. The sooner, the better: Both airport construction and aircraft design take decades, and have lasting effects. Today’s newest planes may well be flying in 40 or 50 years, and their replacements are being designed now. The earlier climate impacts are understood and appreciated, the more effective and less costly adaptations can be. Those adaptations may even include innovative ways to dramatically reduce climate-altering emissions across the aviation sector, which would help reduce the problem while also responding to it. Ethan Coffel is Ph.D. Student in Earth & Environmental Sciences at Columbia University and Radley Horton is Associate Research Scientist, Center for Climate Systems Research at Columbia University. This article was originally published on The Conversation.